A nurse and her suddenly mute patient in Bergman's hands becomes nothing less than a work of art. Everett Collection Bibi Andersson, Liv Ullmann in Persona, 1966. 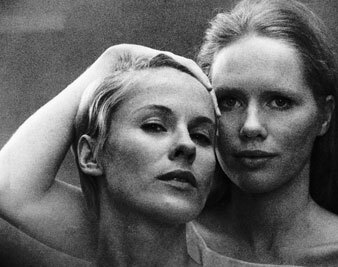 Stars: Bibi Andersson, Liv Ullmann. A nurse and her suddenly mute patient in Bergman’s hands becomes nothing less than a work of art. Bergman’s Persona offers the bifocal pleasures and surprises of multilevel dramatic communication. It can be read, somewhat mystically, as a tale of the transposition of souls, or, more prosaically, it can be understood as demonstrating that muteness is a form of aggression, that a person capable of implacable silence can fracture and distort the personality of another who offers contact through speech. On other terms, the picture is at once relentlessly clinical and a figment of pure cinema—which latter reading Bergman encourages by introducing the work literally from within the projector, by equating dream with reality, past with present, by interrupting his narrative with clips of other movies from other times, and by allowing his venture to run down at the close like some clockwork coming to the end of its spring. All this is accomplished with the casual necromancy that has made Bergman a Prospero of the camera, and one leaves the theatre almost physically done in by the film’s demands on one’s wits. At the same time, there is a letdown in retrospect. For one thing, although its cinematic nature is so deliberately emphasized, the work advances in a series of almost static tableaux, and fails to develop the flexibility and flow that almost invariably form the structure of rewarding movies. Since one of the two main characters refuses to speak and the other speaks compulsively, the picture becomes focused on words, and an audience dependent on subtitles finds itself reading almost as much as it is watching or listening. Further, Bergman here carries the main burden of his tale in close-ups, using them to such excess that the technique takes on moral overtones. To close in so persistently on people is itself a form of aggression, and the device achieves a semblance of emotional intensity by means as inherently suspect as the use of blood-stirring music to support dramatic peaks. At a distance of two inches, eyes invariably start and lips invariably become sensual cushions of flesh. The context may justify such melodrama, but the effect is so mechanically achieved that the burden of congruity is on the director. And as with most mechanical stimulants, the close-up rather quickly creates a dependence, so that unless you use it with great discipline—only in moments, as it were, of the most severe need—it becomes a habit replacing more valid ranges of communication. It looked to me as though Bergman had become addicted in Persona. The film pivots on two long speeches. A prominent actress, who one night has faltered in her lines, lapses during the next day or so into a state of silent passivity which her doctor cannot penetrate. In some desperation the physician packs her off with a sensitive nurse to a lonely spot on the shore, hoping that the peace and the enforced intimacy will break the spell. There thrown on her own resources, the young nurse (Bibi Andersson) chatters through the idle, healthy days on a slowly rising note of anxiety and with disturbing suggestions of physical attraction. One night, after wine, she regales her patient (Liv Ullmann) with a detailed account of an afternoon of sexual abandon she and another woman had once enjoyed with two young boys encountered on a secret beach. This long speech, offered perhaps as a seduction, is followed by Lesbian embraces which may very well be dreams, but which in any case signal that the nurse-patient relationship is shifting, with dominance passing to the older woman. The nurse’s vulnerability accelerates when she accidentally discovers that her impassive charge is in fact observing her with indulgent amusement. She deteriorates rapidly through bouts of hysteria and physical passion to the level of her second pivotal speech. On this occasion, the nurse subjects the woman to a diatribe of accusation, attributing her condition to guilt of shocking proportions, and pouring out a flood of detail she could not command except by identification with her patient’s psyche. Bergman runs this scene twice, the second time focusing on Miss Andersson’s face, which undergoes kaleidoscopic malformations as she rants. From moment to moment she takes on a vagrant resemblance to her listener, an effect a little too pat to be compelling, particularly when it has been foreshadowed by a reference to the fact that they look alike. This second turning point also collapses into a scene of ambiguous violence. The next morning the patient packs up and leaves (still speechless) and the nurse, having put the house away, presently follows. The film runs out. Life deals this way in inconclusions, and I don’t object to Bergman’s pretense that the camera sees what it sees and keeps its counsel. I am prepared to spin my own hypotheses as long as I feel I can trust the premises. In this case, though, I’m not certain I do trust them. Bergman takes liberties with these women that are permissible only to a lover or a doctor, but it isn’t clear that he is sufficiently committed to them to play either role. He seems to be up to some game. This comes back to method. One is forced to spend much more time in examining these women than in getting to understand them. They are treated as objects not subjects—an attitude which, whether intentionally or not, is relevant to contemporary corruption. And in all probability a film so disproportionately verbal loses much in export. The emphases of speech and subtle discriminations of words are lost when you lack the language; subtitles convey data, but very little of the color of dialogue. In fact, the device is possible only because the cinema is primarily a visual art. To a considerable degree, I think, Persona fights its medium.